So many days I write about the words that encourage my heart but today, I’m sharing some of my favorite songs that lift me up. Music is incredibly healing. Have you found that? I’m sure you can remember songs that have spoken straight to you when you were walking through some hard. It’s not just the words of songs, but often the stories behind them that give me a fresh infusion of hope. The story behind Danny Gokey’s Tell My Heart to Beat Again has shed a whole new light on the words of that song. There are times I just need music to help me process. Music fills me back up and refreshes me. It helps me praise God right in the middle of the hard. It can often trigger tears which I so need to release and always brings comfort and soothing when my heart is wrecked with worry or hurt. There have been countless evenings in the last four years when all the kids were tucked into their rooms sleeping or studying and I stayed up playing song after song. What a balm in those times when the missing hits hard, or the pain of a memory or the worry over what the future might look like. Yesterday was one of those days. I was headed out of town to say goodbye to a childhood friend. Plans were in place, everyone was packed up, my emotions were already stirring at the day’s task and then I got a text from another friend that my childhood friend had passed away in the wee hours of the morning. We had not gotten far, so we turned around and unpacked the car. So many emotions. I still have not teased them all out, but yesterday my heart just stayed heavy. With a cleared day and no plans, I took my youngest two to Jungle Book. I wanted the bucket of popcorn and the large diet coke and the fun kid movie to just take me away and distract me. But later in the evening, I began queuing up the songs that meet me when my heart is hurting. That’s the thing about music — music helps me address the hurt rather than avoid it altogether. 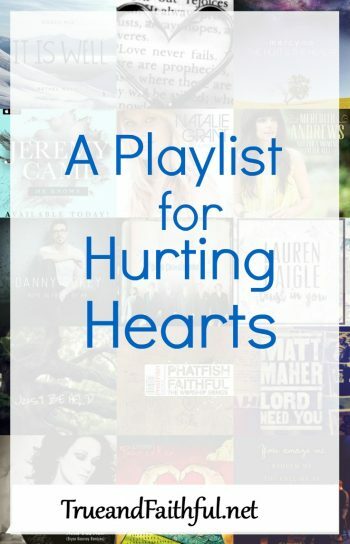 So, I offer you today a playlist for the hurting. These are the songs that speak to the pain but don’t leave us there. These are songs that encourage and give massive hope. If you’d like to get more encouragement in your inbox a couple times each week, I’d love for you to subscribe here. Great songs…I’m going to have to look up the JJ Heller song. That’s a great song, Laura. I just went and listened to it. I received the scriptures to read, but not the book?? So true, Lisa. Music can be so healing. There are several here that have helped me in dark times. I can’t bring to mind all the many that have, but one that helped me in a time of deep depression is “Steady My Heart” by Kari Jobe. “I’m Worn” by Tenth Avenue North often speaks my heart. I am keeping this list and looking up the ones I don’t know. Thank you so much! Blessings and hugs to you! Kari Jobe’s songs are always amazing. I Am Redeemed, by Big Daddy Love. Amazing song. The Hurt and The Healer came out a couple of months before my husband passed away from a fast illness, I leaned on that one a lot! And also on Plumb’s Need you now. Nowadays it’s Good Good Father and Trust in You. So thankful for music that heals, Molly. What a warming list, Lisa. Alhtough it has a slightly different flavor, more for the hurried, the chorus can speak miles for any situation. Breathe by Jonny Diaz. It was hard to narrow down the list, but that’s a great song. I’m going to have to look up Beyond…I LOVE Aaron Jeoffrey. Every last song on your play list have been soothing balm to my heart. Our daughter was in a bad car accident Oct 9 and received a severe head injury. Life turned upside down in that second. We are almost seven months into one of us at least being in the hospital daily. It is long. It is tiring. There is no normal right now. We don’t know what each day will look like because we don’t know what our daughter’s day will be like. It is living truly one day at a time. But that is the way we ought to be living out our faith walk. This has just been a hard way to learn it. The worship music often carries me through each day. Thank you for your list! Lisa, I shared Danny Gokey’s video, thank you so much for that. Your list is awesome. I might add Stronger by Mandisa and Oceans by Hillsong United. The story behind that song really deepened its meaning. Xo Karen. Hillsong has some great ones. If you like Hillsong, you might really enjoy the Phatfish song “There Is a Day.” It helps me get my eyes off the temporal and onto the eternal. I enjoy all the ones you listed as well. Thank you for EVERYTHING!!!!!! Oh, wow, what a great list. Damaris Carbaugh came to our church for a conference and sang He’s Been Faithful. Her voice is so rich and the lyrics are simple and powerful. Thank you for the list, Pam! Did you know that Carol Cymbala wrote HE’s Been Faithful when there daughter had been missing for 2 years????????? Damaris Carbaugh told me that when I begged her to sing that song when she was visiting our church. Mrs. Cymbala also wrote a book during that time. I appreciate you so much!!!!!!!!! Your list contain all od my favourites!! I’ll just add I need a hug on the inside from Laura Woodley. I love songs that speak to my heart!!! Thanks for that suggestion, Carlien. Thank you for this list. It came at a great time, as my mom heart hurts for one of my sons, who seems to keep getting knocked down. He tries so hard, and I know he will climb back up. Congratulations to your son on his character award. We were there for my son last night. Your blog always lifts me up, thank you. It really is, Vicki. I love Nicole C Mullen. LOVE. The list definitely could go on. Thank you so much for sharing this. It makes you realize that we all deal with hurting hearts, and that I am not the only one walking through this. Blessings! I’m sorry you’re walking through the hurt, Patricia. <3 Music is such a balm. After i had a brain tumor removed in 2009, one of the first Sundays i was able to sit through a service (hat and all) the choir sang a song that ministered to me in a mighty way. It was just what i needed. I’m not sure of the title, but some of it goes like this: “Thou oh Lord, are a shield for me. The glory and the lifter of my head.” He was healing me and holding my head. He held my head in his precious hands during that 13 hour surgery. He guided the surgeons hands. Then on that Sunday, just when i needed it, He ministered to me through a song. Yes, music is and always has been very preciouz to me. My mom was a music major and loved to sing. I am now blessed with a sweet daughter who takes after her. God is so good!!!!!! Yes, He is. I can hear them sing it as I’m reading your comment. Love it, Aleatha. Music is so important for our well-being, I believe. When we are praising the Lord, our hearts can only be filled with joy! Thanks for sharing. Lisa, I agree. Music definitely does something to the soul. There is an ease that comes over me when I listen to music. Worship is my favorite part of our service at church. It provides an atmosphere for surrender and for the Holy Spirit to come. Thanks for sharing this today. Such a great reminder of the power of music! Neighbors with you at Coffee for Your Heart. And I agree with your list and those in the comments…..so many great songs to speak to our souls. Will have to look up a lot of these song suggestions, they sound great. I just heard one recently by Meredith Andrews called “Jesus Sees”. It is really good.